Music is a lively and vibrant department which encourages participation by all, regardless of ability or age. It is a community driven environment which enjoys many successes. We work extensively with the other schools in the area, both primary and secondary, and regularly celebrate our students’ achievements. We run fantastic choir trips abroad. In 2017 we took 40 students to Australia and in 2018 we took 36 students to Germany. Students use a range of skills to learn the basics of song writing, music from other cultures, music-related ICT, the music business and much more. A practical approach is taken to all lessons with students having the opportunity to perform and have their work informally assessed in every lesson. This unit is designed to form a ‘gathering’ of the variety of musical knowledge brought by students from their primary schools. It gives students the opportunity to develop their understanding of the process of composing by creating and performing music in response to a non-musical stimuli. During the unit students explore how sounds can be used rhythmically to create a composition. Continuing on from the introduction of notating rhythms, students are encouraged to maintain this skill as well as developing the ability to perform by ear. They are asked to create moods and atmospheres given to them. This is a group topic and students are introduced to the un-tuned percussion. This unit is designed to give students an introduction to pitch and melody. It is intended that from this topic onwards, both pitch and rhythm will be included in classwork. This unit is intended to follow on from the introduction to pitch. 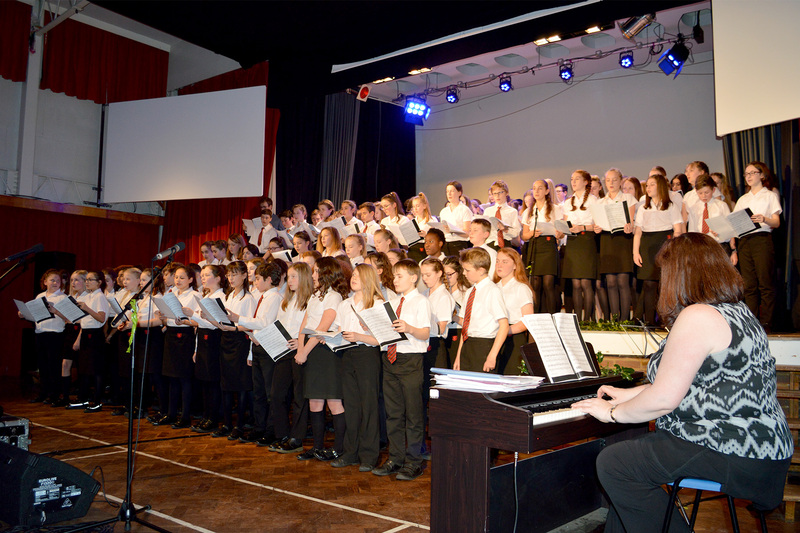 It involves students playing an arrangement of Scarborough Fair and enables them to work with a variety of class members and perform in 4-part harmony. This unit is designed to introduce students to the software ‘O-Generator’ whilst exploring the development of polyphonic textures and complex rhythms. Students learn the basic skills of producing their own compositions using ICT and also develop their knowledge of chords and melodies covered in Unit 1. This unit is designed to introduce students to the various ‘periods’ of music. They learn the names of the periods and then concentrate on the Medieval period, learning keywords and features as they go along. It is intended to include some practical work. This unit develops student’s ability to use instruments and devices to compose and perform their own, and others, work. They explore the basic ideas of song writing and begin to compose in a melody/accompaniment style. They also see how composers can use musical devices and harmony to compose melodic pieces of music. This unit is designed to build on work covered during ‘Scarborough Fair’ in Year 7. Students develop their awareness of others during a 5-part harmony performance situation. They use a variety of instruments and scores. This unit is designed to introduce students to the software ‘Sibelius’ whilst exploring the structure of canons. Students learn the basic skills of producing their own compositions using ICT and also develop their knowledge of chords and melodies covered in Unit 1. Students are ‘dropped into the deep end’, emulating as nearly as possible the real-life learning practices of young, beginner popular musicians. They have the generic aim of listening to a song and copying it, which is an ongoing objective that stretches over a number of lessons. This unit is designed to continue from the skills learnt in year 7 with the sequencing software ‘O-Generator’. Students learn the foundations behind club-dance music and compose a piece in a similar style. This unit is designed to introduce students to the techniques required to play the keyboard (both melody and accompaniment) and to teach them further skills on following traditional notation. This unit is designed to develop students’ knowledge of Sibelius and introduce them to Film Music. Students build on the skills from year eight to produce a piece of music for at least four instruments to accompany a short film clip. This unit is designed to introduce students to African music and provide them with the experience of performing music in this style. It is also particularly relevant for those students who are considering taking this subject at GCSE level. This unit is designed to develop students’ knowledge of the keyboard through performing and improvisation. They also learn the historical and geographical information behind blues music. This unit is designed to introduce students to more ‘unconventional’ music and notation. Students are encouraged to listen to and perform experimental music through graphic scores. They are also assessed on an ensemble performance from a composed graphic score. This unit is designed to develop students’ techniques from Year 8 in composition and performing. It also teaches further skills in following traditional notation and will act as an introduction to one of the set works studied on the GCSE course. At Key Stage 4 students have the choice of studying either GCSE Music (following the Edexcel Specification) or Rock School – Music Practitioners (Technology). The GCSE course incorporates performing, composition and listening skills and is a mainly practical course. Students are required to complete coursework comprising of 2 compositions (30%), 2 performances (30%) and an examination at the end of the second year where they listen to music and answer questions based on familiar work they have been studying and also unfamiliar work. The Rock School Music Practitioners course is equivalent to one GCSE and when successfully completed and is graded at pass, merit and distinction. Students are required to complete four units of study with a number of tasks in each ranging from recording a musical product, using a digital audio workstation to researching genres of music. Lessons are a mixture of practical and theoretical and students are taught to comfortably use both Windows and Mac operating systems. Students use Logic to create their recordings. At Key Stage 5 students are currently offered the traditional route of A Level Music following the Edexcel specification. This Music pathway is the more traditional continuation of the GCSE course with the format staying very similar. A Level music is taught through the consortium arrangement, with the home centre maintaining at least one hour of contact with their own students per week. New this year is the Rock School Subsidiary Diploma Level 3 Music Practitioners which is taught at The Priory School for all the Consortium students. Students will cover multi track recording skills, recording techniques, podcasts and careers in music. Units selected for this unit depend largely on the skills and strengths of the individual students within the group and is a very personalised course. A Level – At Key Stage 5 students are currently offered the traditional route of A Level Music following the Edexcel specification. This Music pathway is the more traditional continuation of the GCSE course with the format staying very similar. A Level music is taught through the consortium arrangement, with the home centre maintaining at least one hour of contact with their own students per week. BTEC Level 3 Music Technology – We also offer BTEC Music Technology at The Priory School for all the Consortium students. Students will cover multi track recording skills, recording techniques, podcasts and careers in music. Units selected for this unit depend largely on the skills and strengths of the individual students within the group and is a very personalised course. BTEC Level 3 Performing Arts (Music) – New this year we also offer BTEC Performing Arts, Music. This is an alternative course that we offer covering topics such as; Music Theatre Skills; Performing Arts in the Community and Singing Techniques for performers. Again this is a very personalised course. In the department there are ensemble rehearsals every week with some groups rehearsing twice a week. We have just launched a new music managers scheme. The students can apply for the roles at the end of the school year ready for the new academic year. It’s a great opportunity to work alongside the Music department staff in providing a range of supporting roles, the details of roles can be found in the Music department. In addition to this, they have taken part in vocal workshops and have recently performed alongside Blake as part of their tour at The Gordon Craig Theatre. The department also works closely with local primary schools and invites them to performances as both audiences and performers themselves. More recently, we have been visiting primary schools offering arts workshops which was very successful. Most recently, the Junior, Senior and Chamber Choirs all participated in the Music For Youth Regional series. We were very excited to learn that our Chamber Choir has been invited back to perform at the National Festival which will be in July at Birmingham Conservatoire. For information regarding possible careers in music, please visit www.careersinmusic.co.uk. Come and see any member of the Music Department as we also have resources and can discuss any career related question you might have. We also have an extensive number of peripatetic staff working within the department providing students with individual instrumental lessons. Students can choose from 20 minute or 30 minute lessons on a wide range of instruments. Further information is available on request.